Web News System: Someone has bid over £35,000 on eBay for a mystery box even though no one but the seller has a clue what's in it . Someone has bid over £35,000 on eBay for a mystery box even though no one but the seller has a clue what's in it . A shopper has bid more than £35,000 on eBay for a mystery box even though there is no clue to what is inside. 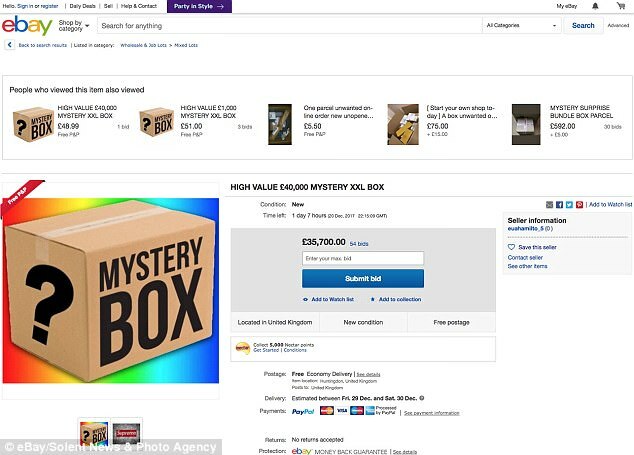 The item listed as 'High Value £40,000 Mystery XXL Box' has had over 50 bids from potential buyers trying to win the peculiar box. The description also says 'Hype Beast' and 'Euro $Euro %text#8217; but fails to offer any insight as to what might be inside. The seller, whose username is 'euahamilto-5', has only been an eBay member for three weeks and has only one other item listed which is another box labelled as 'Mystery Gucci Box £25,000'. Each listing is accompanied with an image of a box on a rainbow coloured background with the words 'Mystery box' and a '?' on its sides. When the box is sold it will be posted to its lucky buyer by Royal Mail 2nd Class from Huntingdon, Cambridgeshire. The auction is set to finish tomorrow (December 20). Mystery box auctions have become something of a strange trend on eBay, with some boxes selling for as much as £50,000. Famous YouTubers have videoed themselves opening the boxes they have bought, revealing the contents. YouTuber DerekDeso, who has over 1.4 million subscribers, released a video of him opening one he claimed he spent $50,000 (£37,410) on. It contained electronic devices such as an Apple laptop and more peculiar items like handcuffs and sweets. The box also included a wedding ring and a letter from the seller claiming that they were going through tough times.